The Riverboats Music Festival is 100% committed to minimising its impact on this precious planet of ours, BUT we need your help! From 2019 onwards Riverboats will no longer sell single-use plastic bottles from any of its bars or food outlets. Help us by bringing a reusable bottle from home and refilling at one of several water refill stations dotted around the site. 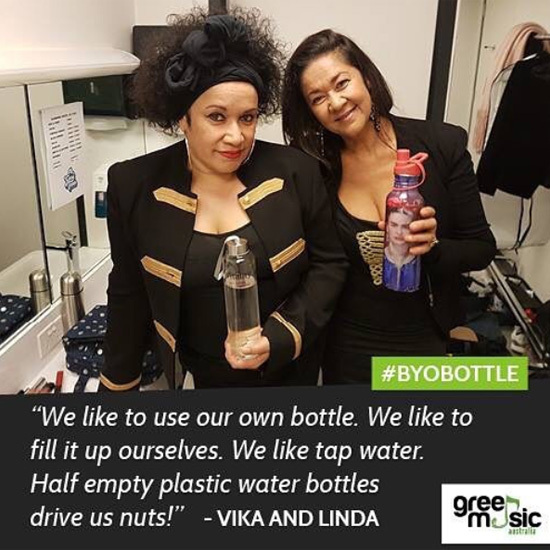 Riverboats and Green Music Australia have teamed up in 2019 to present the refill-not-landfill bottle library, where reusable water bottles can be hired for the weekend at a very low price. Located next to the festival box office, we invite you to pop over and hire a bottle for the weekend. At the end of the weekend simply return your bottle to the library, where it will be washed and reused at another festival! 100% of all profits raised go back into greening the music scene. Bring your own coffee cup to Riverboats 2019 or purchase a branded cup from either Community Living & Respite Services (next to the box office) or the Riverboats merchandise tent and receive 50c off the price of your coffee! 100% of all profits raised from the sale of our coffee cups will be donated to Community Living & Respite Services. Reusable, festival-branded wine glasses will also be available for purchase via our two bars and merchandise tent. All food containers, cups and disposable wine glasses sold on-site are made from either bioplastics, sugarcane, or paper sourced from managed plantations. These items can be commercially composted, meaning they will break down into nutrient-rich compost within 120 days. Riverboats is currently working with the Shire of Campaspe on a longer-term strategy to provide on-site compost bins to handle our biodegradable containers and food waste. In the meantime we ask that you place all food containers and disposable glassware in the red waste bins provided throughout the festival site. Aquatic Reserve is one of the most beautiful festival sites in Australia, and we’d like to keep it that way. Please dispose of all rubbish in the red bins provided, or better still take it home with you. 100% compostable rubbish bags will be available from the main entrance gate - grab one and help us out by collecting your own rubbish! In addition, Echuca-Moama Community Projects have installed a series of CanCrush units across the festival site - simply crush your empty aluminium can, drop it in the container and they will be exchanged for funds that will flow back to local community projects - happy days!